Seems like at one time or another, humans have tried putting sails on just about everything including, apparently, wheelbarrows. The online Low Tech Magazine has a cool article on just such technology. Apparently some of the sails were quite sophisticated, not just pieces of cloth, but battened junk rigs with control lines running back to the handles of the wheelbarrow. This allowed the wheelbarrows to sail at an angle to the wind. The Chinese wheelbarrow differed from the European wheelbarrow not only in the size of the wheel, bigger, but also in its placement. The load was balanced on the axle of the wheel which meant that on a level surface, the barrow driver only had to overcome friction. 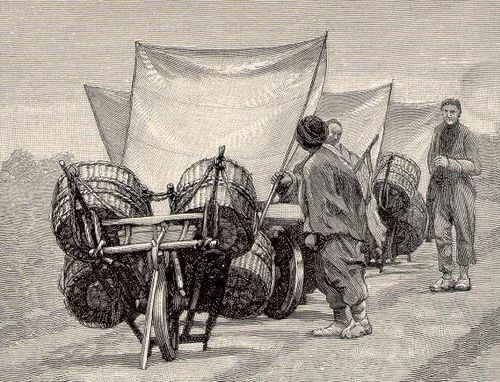 The total weight of the cargo was being carried by the wheel. On a European barrow, the kind that is still being sold here in stores, the weight is centered between the axle of the wheel and the handles, which forces the barrow driver to carry half the weight, limiting the use of the barrow to short trips. In any case, check out this and other articles in low tech mag. 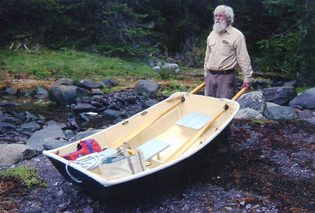 Which reminds me, every once in a while, you will see articles on wheelbarrow boats in the small boat magazines. Unfortunately, the wheel is usually on one end of the boat and is small, which limits its use to short distances. With a larger wheel placed in a centerboard trunk, the boat could be transported a good distance. Of course we are now talking integral boat trailer, something which probably doesn't work as well as a conventional boat trailer and results in a boat which doesn't sail as well as a boat without an integral trailer. Perhaps I should just quit thinking about this concept. This sort of one thing does many things poorly design is something best left to the military procurement people. You're comparing apples and oranges here. The cart commonly referred to as a chinese "wheelbarrow" doesn't actually fulfill the same function as a western wheelbarrow. It's actually a form of pushcart. The chinese do not use the center wheel cart to move earth and similar loads. When they do, they use a flattop two-wheel barrow that empties by sudden braking or tilting. The western wheelbarrows primary design consideration is the need to use wooden planks to traverse muddy, soft or shifting ground. The single wheel follows the board and can even make right angle turns onto of the board. The chinese pushcart is nicely balanced front to back but is very sensitive to imbalance side to side. Pushcart users spend a lot of time balancing their loads side-to-side before setting out. They even use stones wrapped in bamboo fiber for ballast. A western wheelbarrow by contrast auto stabilizes the load front-to-back and side-to-side automatically when the handles are lifted . Good points, Shannon. I guess the western wheel barrow is more stable because it has its center of gravity below the handles while the Chinese wheel barrow has its center of gravity higher up. And the western barrow is optimized for short hauls whereas the Chinese is optimized for long hauls. How about a removable axle with large wheels on the side? solarBob, check out the article on the low tech site. I think what they pointed out was that the single wheel allows the Chinese barrow to be used on narrow trails and puts the responsibility for balance on the wheel barrow operator. Two wheels require wider, more level pathways and more restraints on the cargo to keep it on the cart. Wheelbarrow is a very important for gardening. A quality wheelbarrow your work make easy. A wheelbarrow is an efficient way to make the transportation of necessary items around the yard. You provide best type of wheelbarrow for the job. Also, Best Wheelbarrow Review it is very useful for work.